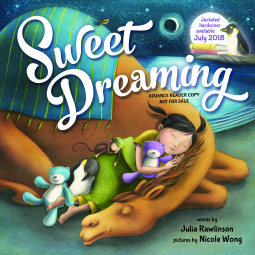 A bedtime story: Sweet dreaming byRawlinson – Joyce's mystery and fiction book reviews with some non-fiction too! In this picture book, bedtime story, a little girl cannot fall asleep. Her mom suggests that she think of some stories and that she will then drift off. Mom goes on to tell several stories (in prose that rhymes at times), none of which is quite right. You can guess who falls asleep first! The illustrations are soft and sweet; all in all a charming bedtime book. Thanks NetGalley and the publisher.